I saw the first two Vengeance singles way back in the '80s in a second-hand shop for £6 each. I didn't have much money at the time and wasn't sure about them, so I left them. I did some research and went back in, later in the week, to buy them. They weren't there (of course they weren't). I spoke to the owner of the shop and told her they were probably worth big buckeroos. She told me someone had lifted them ... and we were both sad. This was a shop I went into several times a week ... and a few days later I was back in there. I spoke to the owner again and she told me she had found the two Vengeance singles, stashed in between some LPs in the album section ... and, sure enough, there they were, on the wall, for £50 each. Oh well. This experience told me to buy anything that looks interesting, even if it means I don't eat for a couple of days. Hi, can anyone advise how this is different from the 2nd issue ? It does have the white border at the bottom & slightly curved top of sleeve but then so do the Surfin Bird 2nd issues ? Do the listed 2nd issue sleeves have no borders at all on & does the black front not have a purple tinge as it looks to in the photo ? If this a different release then is there any more info available on it ? This is the original for sure! BUT how do you know it is a third pressing? Because they just took some from the first pressing that they did paint with the glowing color. I don't think it was an extra pressing. This is the original! The bootleg picture is not clear at all, and the CRAMPS logo is mostly white. This is an original. AUTENTHIC 100% VENGEANCE RECORDS 1978 ,HUMAN FLY 3 ed PRESSING , WITH ORANGE BACK ARTWORK OR PURPLE BACK ARTWORK. 100% ORIGINAL . NOT A BOOTLEG . 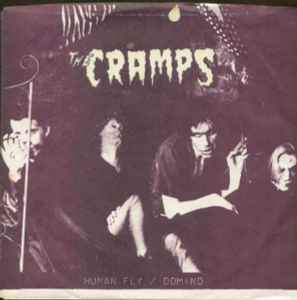 RELEASED BY VENGEANCE RECORDS IN 1978 SELF RELEASED BY THE CRAMPS. This is an 'unofficial' release...it is a BOOTLEG, not from Lux & Ivy!!! Holy Grails (Mostly Over $100) by AustinG.